Welcome back to Life in Details challenges. This month sees the starts of some changes here at LID. Challenges will be posted on the first of the month and are now open to scrapbookers, smash bookers and pocket pagers. The LID team examples will be posted mid month, hopefully giving you some inspiration if you haven't created something yet. So onto the new challenge. 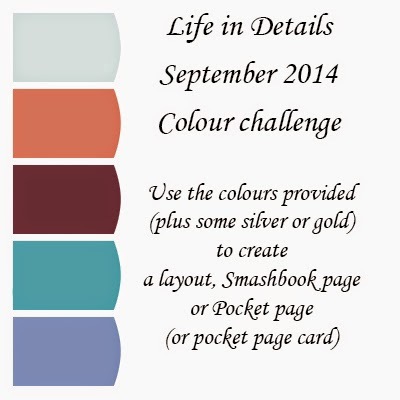 Create a page or pocket page card using the following colours as you inspiration. Upload your creation to your blog or the LID Facebook page (under the Sept 2014 folder) then come back here and leave a comment with a link to your creation by 30th Sept. The winner (as chosen by the LID design team) will be offered a guest team spot for the following month and a small embellishment pack. Love this challenge. Here is my entry http://donnabroussard.blogspot.com/2014/09/wow.html.